Caroline Leavitt has crafted a multi-faceted novel in Is This Tomorrow. It’s a character study, a missing person mystery, a coming of age story, a love story (two, actually), and a commentary on life in the American suburbs of the 1950s and 1960s. It is 1956, and Ava Lark is recently divorced from a husband who turned out be far less than he first appeared. She and her 12-year-old son, Lewis, rent a small house in a middle class area of a Boston suburb. As if being divorced in the mid-50s weren’t unusual enough, Ava is also a working woman. That would appear to be two strikes against her in the conformist Eisenhower era. And, just to complicate her life a bit more, she is Jewish in a strongly Christian (Catholic) city; she and Lewis are the only Jewish family in her neighborhood. This is the backdrop for Leavitt’s study of how Ava adjusts to divorce, single motherhood, and secretarial work, and the social disapproval that comes with all of that. But, Leavitt is not done with this layer cake of a novel. It’s also a coming of age story about Lewis, who has been effectively abandoned by his deadbeat father, Brian. Not surprisingly, he befriends the only other kids without a father, the siblings who live across the street, Jimmy (12) and Rose (13). The next layer is added early on, when Jimmy, with whom Lewis is a blood brother, disappears one afternoon. This sets the major force of the plot in motion. Lewis and Rose, who had grown very close, failed to meet Jimmy as they’d planned. Ava feels she may have rejected Jimmy’s schoolboy crush a little too firmly. The neighbors succumb to the anti-Communist paranoia of the time and begin suspecting not just strangers but even their neighbors and friends. Which brings them to the street’s non-conformist: the beautiful divorcee, the Jewish working woman who was known to be very friendly with Jimmy, her son’s best friend and another lonely, fatherless boy. With all the strands in place, Leavitt proceeds to weave a detailed depiction of the prematurely modern and psychologically complex lives of Ava and Lewis. Ava struggles with her boss and co-workers while searching for love (and a step-father for Lewis) by dating a series of disappointing men. Lewis, a loner who yearns for his father’s attention and approval (neither of which is forthcoming), joins forces with Rose to launch their own earnest investigation into Jimmy’s disappearance, certain they know something that will help to locate him. Rose’s crush on Lewis develops into young love, complicating their friendship. Halfway through the novel, the story moves forward to 1963 and continues for the next several years, allowing us to observe the long-term effects of Jimmy’s disappearance on Ava, Lewis, and Rose, as well as Jimmy’s mother, Dot. Ava meets an intriguing man, but their relationship is fraught. Major changes take place in the lives of Lewis and Rose, as one would expect for people in their late teens and twenties (no plot spoilers here). But the engrossing plot continues to thicken and becomes increasingly dark. Will Jimmy ever be found? Will Lewis, who has found fulfilling work but few friends and no love, come out of his shell and truly connect with anyone? Will Rose make it through a single day without being preoccupied by Jimmy? The past haunts these characters, and the ghosts of the missing Jimmy and absent Brian inhibit the characters’ personal growth and chance at happiness. Surprising (but logical) developments move the plot toward its conclusion, making the last section of the book a suspenseful page-turner. Leavitt ties up the plot strands in a manner that is satisfying but not pat. While some much-needed healing takes place, the characters do not come through their experiences unscathed. 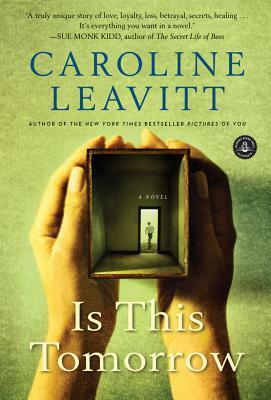 Although a synopsis of Is This Tomorrow can make it sound somewhat melodramatic, Leavitt’s emphasis on her characters’ growth and her sure hand (this is her tenth novel) elevate it to the next level, somewhere between popular fiction and literary fiction. Leavitt has created a cast of characters that readers will grow to care about even when they are not that easy to like. But isn’t that just like our real lives? I picked up a copy of this not too long ago because I heard such great things about it, I just need to squeeze it in. I know it’s one that I’m really going to love. Shannon, I think you will find it a very involving read. There’s a lot going on and most of it is handled in a plausible way, with insight into a range of characters and the culture and mindset of the time as well. In the past, I might have viewed this book as “just” a “women’s book,” but that would have been my mistake and my loss. While Leavitt is not the distinctive prose stylist I usually look for, she writes crisply and well without showing off. There’s a lot to be said for that. And Caroline seems to be about as nice a person as you could ever want to meet. Thanks for reading my blog and being a regular commenter.